Ladies and gentlemen, start your engines! Or strap in. Or click in. Just do whatever it is you need to do to get ready. This is going to be an intense few days of competition! Since 2002, Aspen Snowmass has been the home to the Winter X Games. In January each year, the best winter sports athletes from around the globe gather at Buttermilk, one of Aspen Snowmass’s four mountains, and battle it out for bragging rights and supremacy. The events line up this year includes snowboarding and skiing big air, slope style and half pipe competitions. There is also a snowboarding street competition, and an online video competition known as “real snow”, where the fans get to vote for their favorite video online. On top of this, there will be snowmobile speed and style competitions and also a snocross competition where snowmobilers race around a track full of jumps and banked turns. Add this to the snowmobile best trick competition and we’re not going to be left short of adrenaline filled thrills and spills! There are plenty of fun facts behind the scenes and also plenty of fun storylines running through the competition too. Shaun White is lining up to win his sixth consecutive gold medal in the snowboard super pipe. Tucker Hibbert is also lining up for his sixth consecutive gold medal in the Snowmobile Snocross. The tallest building in Aspen (by 13 feet) is the 65 foot high super pipe control tower. 75 different scaffolding structures have been built for the competition. Over 1 million people have attended the X Games in Aspen over the years. And over 35.4 million people in the US along tuned in to watch the X Games 2012 on television last year. Come check out the action! Winterskol is Aspen’s annual toast to winter, dating back to 1951. A celebration of Aspen’s unique Nordic lifestyle, the four day celebration features on mountain activities, a canine fashion show, a snow sculpture contest, fireworks and everybody’s favorite activity – Soupskol! Beginning today, 4 selected teams have 48 hours to sculpt an 8’ x 8’ x 8’ cube of snow into a freestanding creation. Our sales & marketing director, Jeff, is once again helping out a friend involved in the sculpting process – keep an eye out for an old man in a hot tub! We can’t wait to see the finished product! Soupskol is held on Friday night in the heart of the downtown core. Cooper Avenue and Hunter Street will be blocked off to cars and will play host to a soup contest, with many local restaurants offering up a free sample of their best soup! Participants can text message their favorite in order to vote, and the winner receives the coveted Soup Bowl Trophy, along with bragging rights until next year. This is always a crowd pleaser! Saturday features a canine fashion show on the Cooper Avenue Mall from noon to 1:00pm, and is sure to generate a few laughs and a generally great atmosphere. The highlight of Saturday night is a torchlight descent of Aspen Mountain at 8:15pm, followed by what will surely be a phenomenal fireworks display! Come join us for a fun-filled weekend celebrating all things winter! With a storm coming through on Friday evening, the skiing will be great and the weekend will be one of the best of the season! Visit our website for the latest deals and specials. Check us out on Facebook under The Innsbruck Aspen and on Twitter @innsbruckaspen. 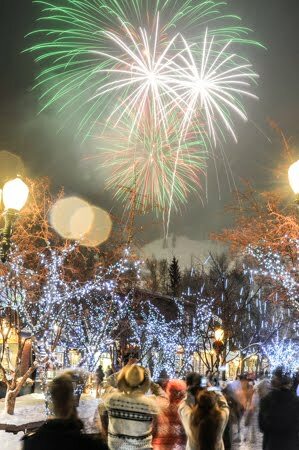 The New Year was celebrated in proper Aspen style – champagne flowing, parties everywhere and once again, an amazing fireworks display put on by our amazing little town! Smiles all around! This time of year comes with a lot of reflection and a lot of anticipation – fond memories of what has been and excitement over what will be. 2012 was a great year for our team, capped off with The Innsbruck reaching #1 of 36 hotels in Aspen on www.tripadvisor.com. This is truly an honor that cannot be understated and something for which we are incredibly appreciative. Given this context, however, is it wrong of us to be thinking solely about the weather? It’s been an incredible run of weather we’ve been having! Plenty of snow has fallen over the past couple of weeks leading up to the New Year, giving everybody the much needed powder turns they’ve been craving! Add to this mix a couple of cold days to keep the snow soft and fresh and now we’re in for a treat – We’re looking down the radar at perfect blue Colorado skies and 30 degree temperatures right through this weekend! It truly doesn’t get any better than ripping turns through fluffy, dry Rocky Mountain snow under a perfectly clear Colorado sky – it is so blue, it should be defined as a different color! 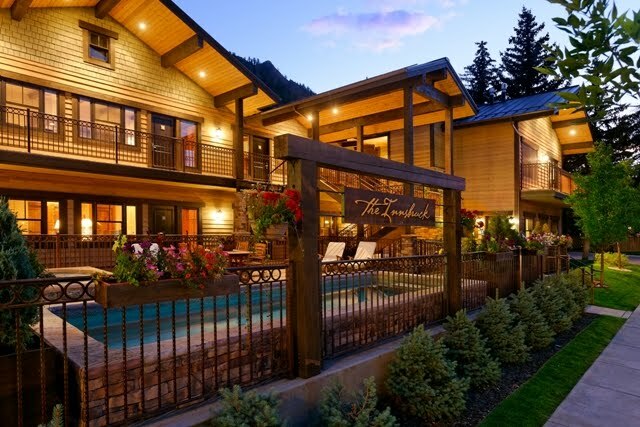 Come join us for a well earned vacation and treat yourself to pure Aspen perfection! We hope everybody has a great 2013 and we’ll see you all on the mountain! Photo courtesy of Chris Council/Aspen Daily News.